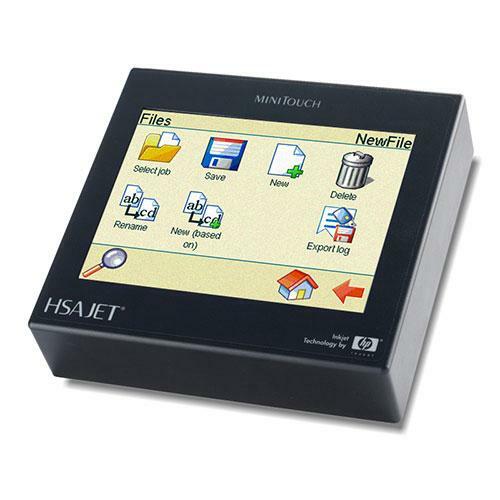 The HSAJET® MiniTouch is based on reliable HP TIJ 2.5 technology which delivers consistent, high-quality, fast printing, exceptional value, and ease of use. The elegant black aluminium casing underlines the robust design, making it perfect for being installed in production environments. A USB port is positioned on the side of the MiniTouch. A small cover protects it when not in use. Use the touch pen or simply a pointed finger to control the MiniTouch. Illustrative, easy-to-understand, icons lead users through all phases of building a print job to make printing simple and fast. The controller's small size enables it to fit wherever you want it. Using cables up to 15 m long, the controller can be mounted far from the actual point of printing. It can be operated straight from the touch interface or by using the remote controlling protocol, providing yet another integration tool. Our MiniTouch Premium version is made specifically for our Premium printheads, made from hard anodised aluminium. The Premium printhead has a stainless-steel footplate, which ensures that the print head is completely free of static electricity. Furthermore, the footplate encloses the nozzle area to avoid air turbulence and provide optimum print quality for high-speed printing. Read more about the Premium printheads in separate flyer. The HSAJET® Premium MiniTouch MTHP4 can control print height up to 2", either as single heads or in a combination of 1-, 2-, and 3-pen printheads. While the first print is being executed, you are able to setup the next layout for printing. Once the first layout has been printed, you can execute the prepared layout right away. Flexible user-level management guarantees that the correct data is printed. You are also able to grant user rights as desired and protect the data with a unique password. In addition, content may be filled using a prompt which, as an optional feature, must be validated by a different user to guarantee accuracy. The controller is preloaded with a number of language files to provide menus in different languages, as well as regional month and day names.